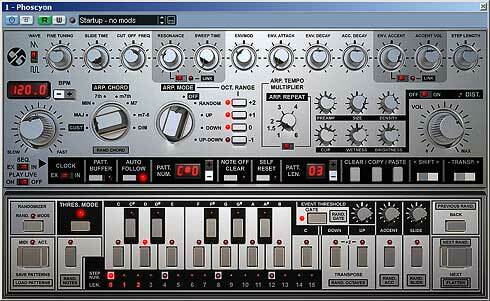 D16 Group Phoscyon - Superbly versatile and accurate tb303 plugin synth with additional features. Today I got a new email from the D16 Group informing us about their forthcoming release of a mouthwateringly good looking TR909 clone drumbox.. wow!... Then I realised that we hadn't added a review of the PHOSCYON TB303 clone/synth that the D16 GROUP guys also make!... Oh man!... We've been so busy with site server related nonsense in the last year we totaly forgot, and the poor old PHOSCYON has been sitting in a VST plugins folder waiting for some more recent attention! Ok, so I loaded up Cubase SX and spent an hour messing with PHOSCYON again... I'd spent more time with the plugin synth back when we received the review copy and it all came back to me fairly quickly as I revisited this superb plugin. 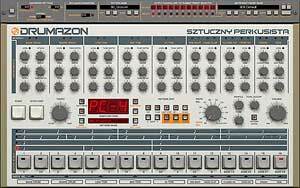 Now some say ACEEED will never die, they are probably right, it's a sound always in use in a variety of genres, and indeed, some people will be soley interested in the PHOSCYON's TB303 cloning ability. There are a few contenders around offering various levels of TB303 attainment, from freebies such as Creakbox which are very good, to other non-freeware's which set about 100% attempting to emulate a good ol' silver Bassline. PHOSCYON is an odd one, it'll get you uncannily close to silver-box land, but offers a whole lot more in it's GUI interface for securing all sorts of groovy patterns & sounds in a variety of ways and lifts the unit off to beyond 303 world. 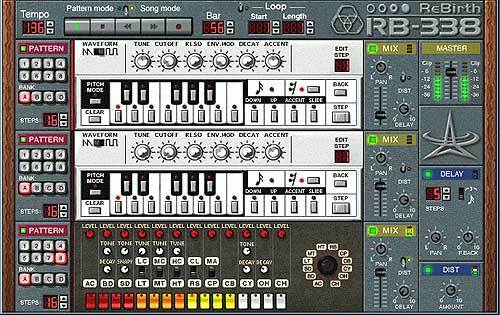 PHOSCYON offers 2 basic ways to do '303' stuff..
You can use the INTERNAL sequencer of PHOSCYON, clocked to the host sequencer such as Logic, Sonar or Cubase, and compose, save & load patterns to order... I'll call this method of working PATTERN TRIGGER MODE. Working in this way one uses a combination of classic TB303 controls to create patterns... Stepping UP/DOWN the available 16 front-panel STEPS and inputting Notes or Rests as well as accent, slide and octave switches. 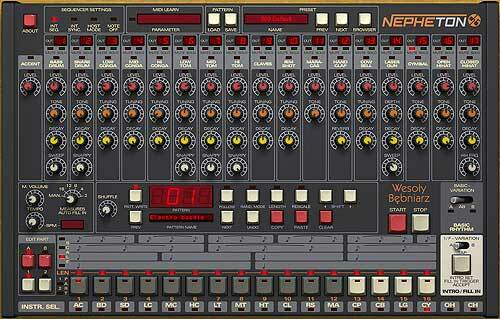 Anyone who owned a 303 will find this easy, and noobs with some manual-reading and experimentation should get to grips with this easily too. Now this does NOT mean PHOSCYON plays in the KEY of C1 or D1 or whatever note is triggering it, in this PATTERN TRIGGER MODE the note number used to trigger PHOSCYON simply relates to a pattern held in PHOSCYON's internal memory... So, working in that way, single note-presses on a master keyboard or drawn-in notes in a sequencer grid will trigger patterns within PHOSCYON as long as the note lasts while PHOSCYON clocks it's tempo to the host sequencer's internal clock... easy-peasy!.. and VERY effective. In that PATTERN TRIGGER MODE you can specify how many STEPS individual patterns will have, and it clocks and plays along, allowing you to create 16 step, 12 step, 6 step, 3 step or whatever step patterns which cycle round in sync with the host sequencer clock and any other music you have playing along such as drums. You can also simply move the whole pattern UP/DOWN in key without having to copy the pattern to a new slot etc. PHOSCYON can hold 128 patterns in these note 'slots' which is ALOT of patterns to play with without ever having to load new ones. You get a whole oad of patterns in the unit when it opens to get you going, and of course patterns can be saved to disk and loaded into whatever note 'SLOT' you like.. wonderful! There's an arpeggiator onboard which is dead easy to use and has 2-octaves up & 1-octave down travel and even a selection of scale=mode types... Major, Minor, 7th, Minor-7th, Major-7, Major-7 Flat-5 and Diminished!.. Loverly!... Add to that the Arp Tempo Multiplier and you're in heaven for instant creation of a huge pallette of riffs and patterns... Use the Arpeggiator with either whole-bar single notes or with changing notes within a pattern for more variation. It's a great addition and a few little tweaks can yeild great patterns you probably wouldn't have thought of if trying to deliberately write something... Good for beginners and the experienced user! The 6 additional controls act like a sort of mini customisable distortion unit, and a HUGE variety of overdrive characters can be coaxed from this silver wunderbox... from thin & screaming to hollow fat and dark... really, it's quite a phenomenal addition! Further PHOSCYON additions to the classic 303 offers seperate or linkable Envelope Accent & Accent Volume controls plus Accent decay (very useful!) as well as a seperate Envelope Attack & Decay... The Resonanace control has a second additional pot called SWEEP TIME!... Nope, it's actualy nothing to do with The Sooty Show, in fact this extra control sort of add's a subtle adjustable attack-time to the Resonance. To the left next to the traditional Tuning control there's a control pot called SLIDE TIME which does as it suggests increasing/decreasing the overall SLIDE time of notes given a SLIDE setting. There is also a dedicated control called: STEP LENGTH... This one's very handy for making PHOSCYON sound less 303-ish... You can reduce the length of triggered notes allowing you to create very staccato notes when required or make them just that bit longer too!.... 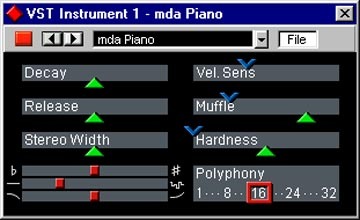 Finaly, to SAVE & LOAD your precious internal patterns, PHOSCYON uses it's own dedicated SAVE/LOAD protocol via the bottom-Left silver button, so one assumes that created patterns can be loaded regardless of which sequencer it was created in as the unit doesn't depend on using the host sequencer's SAVE/LOAD protocol for plugin patches. All in all it's a great affordable addition to any computer music makers setup, and for the outlay offers very excellent 303 emulations but also so much more!... Old 'cheezy quavers' will get a kick out of making old-skool patterns in the trad' way as well as using the other fine front-panel additions, and noobs will be surprised by how easily they can fiddle with a few controls and suddenly create great sounding patterns using the arpeggiator. You can also use it just like any other regular plugin synth to play your standard note patterns.... Yup, The D16 GROUP PHOSCYON... It's like having a seriously modded custom 303 without the expense... and that distortion!... yummy... trust me! 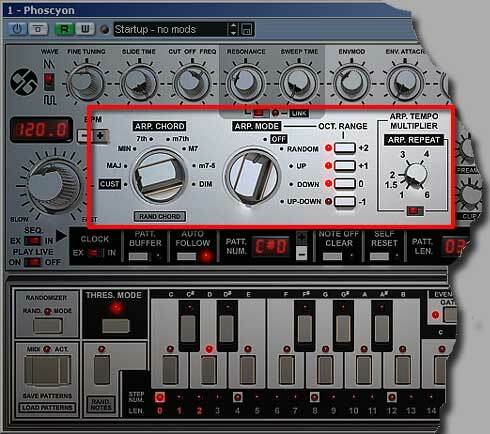 There is no better choice than Phoscyon for easy and cheap VST 303 clone. Even if some other brand can e more realistic, the Phoscyon got an original feeling, perfect for acid lines and experimental responses. That the one i choose, first for the price and then for the good integration in DAW. AudioRealism got a better product, closer to the original TB but Phoscyon rules in the Hi frequencies. The internal distortion is great but for basslines, aditional overdrive is mandatory to sound harch. The most grinded sound i eard for less than 50 euros.